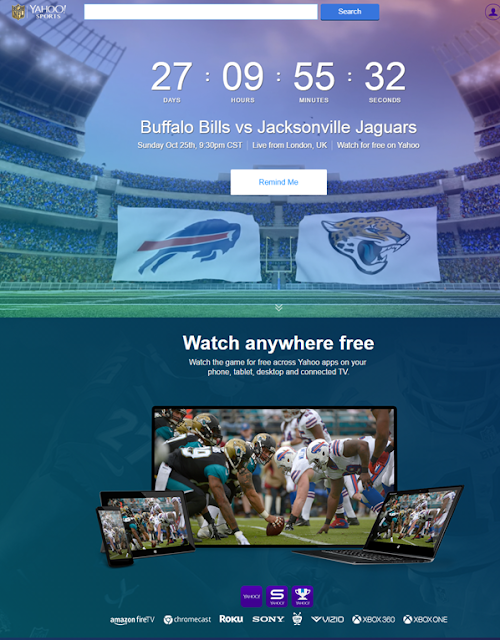 Yahoo has recently announced via their official Tumblr website the countdown to the launch of https://nflstream.yahoo.com/, the first ever free National Football League (NFL) global livestream for all devices. This is produced by NFL and Yahoo Studios especially for the die-hard NFL fans, where they can see the latest team stats, videos and behind the scenes content. On game day, October 25, fans can tune in to watch the Buffalo Bills take on the Jacksonville Jaguars in London in whichever device they prefer – their desktop, laptop, mobile device or tablet. Now you can take your NFL game anywhere, as long as you're connected online. Also, you'll be updated with the team stats, standings together with behind the scenes coverage and interviews.